I'm in St. Louis. Though it's been a night to prove that gluten does impact my neurology, nonetheless, I'm feeling fine. I have much for which to be thankful, starting with a Eureka! moment which I had in January of 2013, in the middle of a winter's night. I awakened suddenly, sitting ramrod straight in bed, exclaiming, Didn't my brother Stephen have another daughter? I couldn't wait for sunrise; I called my sister Joyce immediately and demanded that she tell me if she knew. You woke me at 5:00 a.m. to ask this question, she all but grumbled. She cleared her foggy brain and then said, in wonder, Yes, yes, I think he did. Wasn't his girlfriend back then named Sherry? I pondered for several days. All I could recall fit into a five-minute recitation. Steve's girlfriend Sherry had a baby; the baby had something wrong with her; my mother bought the baby some medical supplies; the baby came to our house a few times. Following that: a void. My brother Stephen, dead these 17 years, could not easily be consulted. My mother, gone for 29 years, remained silent. My brain could not pull any more details from its morass of forgotten family tales. So I did what any red-blooded twenty-first century American with a quest would do: I got on Facebook. I didn't announce to the entire world that I was striving to determine if my deceased baby brother had a daughter and where she might be, if so. I exercised just a smudge of discretion. I found a Facebook page for graduates of my brother's high school and posted there: If anyone here was friends with my brother Stephen Corley, please message me. I got a note within a day from Jane Neske-Beckerle, who identified herself as having gone to school with Steve but not having known him very well. She offered to ask others, privately; people whom she believed had known my brother better than she had. Two months later, she messaged again. She had a name, she knew someone who knew my long-lost niece, and they had talked to my niece's mother's sister and decided that I should give them my contact information and they would give it to my niece. Amy. My niece Amy. Amy Marie Barrale, now married to Harlan Broch and now known as Amy Marie Barrale Broch. My niece. My brother's other daughter. It's a delicate thing, reaching into the past to talk to children of a man who did not raise them. I had done this previously, with a beautiful girl who had been his daughter and who had been adopted by her stepfather. The initial foray into that terrain had been nearly disastrous, and seventeen years had been needed to mend the battle scars, assuming that they have ever healed. I did not want to cause anyone else to suffer just because I had a desire to see a face which bore my brother's stamp. So I acknowledged the wisdom of the course of action which Jane suggested and tendered my information. A few weeks later, I had my answer, and timidly reached out to Amy through her Facebook page. Later that year, my son and I drove to Washington, Missouri where Amy and her husband live, and we four met for the first time. I would have found her in any crowd. Though she has her mother's Italian coloring and small stature, the contours of her face are pure Stephen Patrick Corley. This Thanksgiving, my son Patrick and I are back in St. Louis. We had a Thanksgiving dinner that couldn't be beat on Thursday mid-day, at the home of the incomparable Puma, Joyce Kramer. We journeyed slightly west, to St. Peter's, to share a meal that evening with another Joyce, my sister Joyce Corley. We got up on Friday morning and drove out to Ferguson, to see some of the ruination of the riots in the aftermath of the grand jury's decision not to charge the officer who shot Michael Brown, who, like my brother, cannot speak for himself. Part of his story met us in the graffiti on the restaurants and shops of Ferguson, which spoke of love conquering hate. We drove slightly east, to Jennings, to see my childhood home; and then to my old high school, once teeming with laughing girls and now an immense, lonely edifice with boarded windows. Afterwards, we sat, with the Puma, eating her scrumptious tuna salad and listening to a teleconference on the emotional whiplash of the events in Ferguson and how the world might start to change, hosted by a trainer with the Center for Nonviolent Communication. And then we went west, to Kirkwood, and had dinner with Amy and Harlan. They make good dinner companions. They tell funny stories and relate to one another with palpably genuine affection. They exude warmth, compassion and tenderness. Amy has Sherry's sassy, saucy smile but she also has the contours of Stephen's face. She feels like family. She calls me "Aunt CC" and remembers my siblings' names. As we talked last evening, I suddenly realized that even more than what I recall of Sherry Barrale and the occasional, poignant flash of Stephen's smile, Amy reminds me of my mother. My mother. Her grandmother. The four of us hugged in the parking lot of the Italian restaurant where we had dined rather more lavishly then we might have intended. We agreed that the accidental find of the place had pleased us all. We vowed to meet there again, perhaps at Christmas. We talked about a visit that they might take to Chicago where Patrick lives; and the hope that in the spring, they would come to Kansas City. And then my niece, my brother Stephen's long-lost oldest daughter, got in her husband Harlan's pick-up truck and drove away. I'm still smiling. I am immeasurably thankful for whatever force prompted me to waken, suddenly, from a deep sleep, eighteen months ago, remembering that she existed. I'm even more grateful for the chain of people who drew her back to me. Ultimately, I suppose, I am thankful that she welcomed me into her life, and that she holds me and my family no ill will. For she smiled last evening when she told me that in her jewelry box at home, she has her father's class ring, which her mother gave her five years ago just before she herself died unexpectedly. And she was still smiling as we parted. She put her arms around me, in that parking lot, at Thanksgiving time, and I realized that I had come to a restaurant where I could indeed get anything I wanted. My niece Amy Marie Broch and myself. A sign on a boarded building in Ferguson, Missouri, 28 November 2014. For it nears morning, this night does, with its quiet almost soothing traffic noises drifting upward toward my hideaway atop this Brookside bungalow. My constant friend, the ringing in my ears, fills my head and blocks most other sounds. Tonight its symphony soothes me though at times the crescendos which crash through the corners of my mind deafen, driving me to pause, to look around, to wonder, Are these noises bothering anyone but me? I don't think they do but I'm never really sure. The witching hour approaches. Darkness presses against the window panes. Amidst the violins which keen inside this dim brain of mine, I hear another echo: A muffled voice, garbled, as though struggling to reach me from within a heavy shroud, saying, I cannot bear to cause you any more pain. Losing myself in those words, I fall back into the pages of time and I am twelve again. I lie on a stiff sheet, atop a thin pad which in turn skims the cold surface of a metal table. The surrounding air carries no speck of warmth. The gown into which a nurse has slid my small body pools around me though still, for all its excess fabric, I am barely covered. My legs tremble. I have been placed on the table and left, alone. No mother; no nurse; not even a faceless being to stand over me and hold my hand. I shiver. I know why I am there. I complained about the pain in my legs, and suddenly, I found myself in a bed, in a room, with a curtain around me; and now, this. From somewhere behind me a door opens, then closes with an ominous crash. Two white-coated figures swiftly move into my field of vision. Both men, both wearing name tags which I cannot read because the same person who stripped off my nightgown and pulled the drape around me had taken my glasses. I strain to focus the blur which I know to be their faces. I can't tell if they are smiling. One pulls a stool towards my table and perches on it, shifting back and forth. The other stands to the right, and they murmur to each other. I long to know what they are saying but I cannot hear them; they speak in whispers, their faces angled away from my gaze. Finally they turn to me and I see their mouths curve. I think, They are not smiling, just as the one who has remained standing speaks. We're going to do the procedure now, he intones. I wonder, Is he talking to me? and barely finish my thought when the other man suddenly raises his arm in a swift motion that I think will turn into a slap but turns out to be a reach, instead: for a cloth on which some instruments have been placed. I stare at what he's holding: A needle, the biggest I've ever seen. I'm suddenly frightened. The man on the stool tells me to turn my back towards him. Something cold brushes against my skin and I jerk. The man says, "you have to hold still" and I close my eyes. "This won't hurt," he tells me and then I feel something plunge into the small of my back and I know, I am sure, that I am going to die because there is fire in my back, shooting down my legs. I start to cry. The standing man moves around until he can see my face. No one speaks for a minute. The inferno in my back begins to lap upwards, toward my shoulder blades. I feel tears falling on the sheet. The man behind me says, "this is the first time I've done this" and I heave; I feel the bile rise and the standing man says, "now honey you can't move" and places both hands on my shoulder and squeezes me. I give myself to the pain. It's over in a little while. The vise that's held me down relaxes and I sag against the examining table. The one who jabbed me comes around to the front, snapping off the plastic gloves he has worn, tossing them into a waste basket. I study him; the smooth forehead, the short hair, the lone curl slipping down over his forehead, almost to his eyebrows. I see that he carries uncertainty in the red rims which surround his hazel eyes. "For the record." I finally speak. They both turn to me, astonishment on their faces. I hesitate: perhaps I have died; why else would they look so puzzled to hear my voice. "For the record," I continue, "it does hurt." Neither of them respond. The one who used me as his experiment, his trial run at doing a pediatric spinal tap, lets the dark rise within him. We stare at each other until a nurse comes to take me back to my room where I sit up to talk to a candy striper a half an hour later and learn what pain really is: No one told me about spinal tap headaches, no one warned me to lie perfectly flat. I wonder, as the night attendant brings me morphine, whose job that was. Now, nearly fifty years later, I listen to the howl of the night wind and close my eyes. I can no longer recall the face of that doctor. All I can see are his eyes, murky green pools with pinpoint black irises. I can't remember his voice. It has faded, lost among the choruses, the rising swell of all the voices telling me something would not hurt, promising that they would not cause me any more pain. Note: For some reason, the Neko Case song "Nearly Midnight in Honolulu" triggered the memory which I recount for you today. The spinal tap, the first of several I have had, took place in 1968 at Children's Hospital in St. Louis, Missouri. I do not know who the doctor was -- perhaps he was only an intern. I have often wondered what became of him. I hope he forgave himself for lying to me. Or, if not actually lying, then reassuring me from ignorance. I have forgiven him. Neko Case singing, "Nearly Midnight In Honolulu"
The begonias wave their leggy arms at me, searching for light from the unopened curtains. My dog snores in her bed, an unwitting reminder that I must dash to the vet's office before the snow accumulates and get her medication. My bones protest each shift in my chair and I think: Remind me again why you like winter? I tell myself, It's the clothes. I look better in winter clothes. I laugh out loud, the sound of my brief amusement blending with the dog's gentle rumbling. I think about Thanksgiving and begin to ruminate over that for which I'm thankful. I bend against the list of disappointments, straining to shift my focus from that which clamors to the surface: what I lament. I close my eyes and will myself to draw the gratitude from within me. And as I wait, memories flow into the vacuum. It's 1977. I have come home. I've failed in Boston: I've abandoned my place at BC, quit my job, packed my metal rocking chair and boxes of clothes which don't fit and ridden west in my mother's car, my brother Kevin behind the wheel. I've spent the fall cajoling SLU into giving me my spot back in its non-master's track PhD program in the poli-sci department, and found a job with the Knights of Columbus' not-for-profit development program as a secretary in the three-person office. I'm living with my parents. My brother Stephen, 18, lives there as well, and the two of us grouse around the house feeling sorry for our sad selves, me drinking too much Scotch at night and both of us burning our mouths each morning with my father's over-perked coffee. Fall wanes. Winter settles on Jennings, on its old asphalt streets and its cracked concrete sidewalks. My mother has me help her spread mulch over the garden beds and bundle yard debris which my father ties with strong twine. I sit on the wide brick porch in an old flannel shirt that one of the older boys left behind, covered with an afghan, working crossword puzzles and complaining. My mother comes and goes and largely ignores my belly-aching. She does not indulge me but neither does she challenge me. I'm letting my hair grow again and losing weight, the weight of nine months in a city with a Mug and Muffin shop at every T-stop. November rumbles forward. My brother Frank lights fires in Minnesota as a freshman at Carleton College. My mother keeps me updated on him, causing envy to unfurl within me and tear my innards with its relentless claws. I read "The Bell Jar" for the hundredth time and wonder if it's too late to be a writer. I scribble self-indulgent poetry in a notebook and avoid my mother's amused glances. On the Sunday before Thanksgiving, my mother forces me to go to the grocery store with her. We fill the cart with cans of broth, a large turkey, flour, bags of cranberries, whole sweet potatoes. I push the buggy along beside my mother as she crouches to retrieve raisins, reaches for whipping cream and butter. Salted and unsalted. I idly wonder why we need both. On Thursday, my mother raps on the bedroom door shortly after dawn. I've been out late, drinking with my leftover boyfriend from college who should be with his real girlfriend but finds my sullenness perversely attractive and has taken up with me again instead. So I ignore her first knock and she pushes open the door. "Mary," she says, softly. "It's time to get the clover leaf rolls started." In a short while, hands washed, jeans tugged on, flannel shirt wrapped around me, I'm elbow deep in flour and my mother has put on the John Phillips Sousa marches on KMOX radio. I hear my father talking to the dog in the living room, and close my eyes. The sweetness of butter fills my nostrils, mixed with the acrid coffee fragrance, the scent of Pine-sol from the kitchen floor, and the bite of cinnamon from pies cooling on the shelf above the kitchen counter. There, in my mother's kitchen, with my arms covered in flour, I begin to weep. My tears drip from the curve of my cheek and fall into the dough. My mother reaches over and dabs my face with a paper napkin. We do not speak. I knead the mixture which I have created, for the clover rolls that I have eaten every year for as long as I can remember, certainly for the two decades since my crooked teeth came into the small cavern of my toddler mouth. Paul Harvey tells The Rest of The Story and I shape the dough into its three balls per roll, placing them in the greased wells of the cupcake tins, covering the pans with clean towels and placing them out of the way so I can start to peel potatoes. My mother says, "Let's have some Reindling," and I stop what I'm doing, sit down at the breakfast room table, and let her bring me a piece of buttered raisin bread on a purple Melmac plate. She refills my coffee cup and we just sit, eating, drinking, while the dough rises in the kitchen and the radio plays. The snow has not yet started. My coffee has grown cold and I'm feeling that the yogurt which I ate two hours ago might not be enough. I'm regaining my appetite after a month when the sight of food sickened me. The furnace roars into life and I look out the front window, at the greyness of the sky looming above my barren yard, with its blanket of fallen leaves. I see, just over the edge of the sill, the purple leaves of my Japanese maple. I suddenly wonder if there's anything I can do to insure that it survives another winter under ice. As the silence of the house surrounds me, I notice that it is not yet snowing. Somehow, the clearness of the air encourages me, and I head to the kitchen for another cup of coffee. In my ears the radio talks of violence in Mexico and murdered students. As the reporter's voice floods my head, the ghost of complaints which crowded my soul on waking slip away. My aches, my pains, my grief, my loss: they feel slight compared with the concept of a mass grave and burning bodies. I tell myself that life is not a competition, it's an exhibition; but I do not believe that in this moment. And so I pour my coffee, and let the dog out into the yard, and pour some food into the cat's dish, and sit down at the computer to try and make some sense of what I feel. Or what I have experienced. Someone recently told me that I do my best writing when I speak of persons other than myself. When you write about yourself....he began. Then he shook his head. I stood mute and wondered: When I write about myself the quality of my writing degenerates? The stories bore you? The events disturb you? The joys fill you with envy? I did not speak the questions nor receive any answers and the moment passed. I'm thinking this morning not of myself but of a man whom I knew thirty-five years ago, when I worked at a drug store in St. Louis's Central West End. I can see him when I close my eyes: Over six feet tall; over seventy years old; thin body hung with an old serge suit: Jacket, vest, pants, tie. The material had been pressed so many times that its surface shone. The man's skin defined black and stretched taut across his bones. He wore a brown Fedora with a tattered feather in its rim. I worked in the make-up department on one side of the store. Across from me, beyond the ten or so aisles, the pharmacist handed out prescriptions to the stores' customers including the old man. Several times a week, the man would push open the front door and turn left, towards Pharmacist Arthur Perry's domain with its platform full of work tables, from which the pharmacy students counted pills and listened to their client's woes. Art did not own the store. The other pharmacist, Bernie Kuntz, owned it; but no one in the neighborhood timed their stops to be served by Bernie. They all wanted Art and the old man was no exception. Then the old man turned, each time, and inched his way to the front register. He handed the bottle to the girl at the counter, who held it while he drew a thin worn wallet from his pocket. He placed the wallet on the counter, unfolded it, and extracted a ten-dollar bill which he handed, with a slightly shaking hand, to the cashier. When she gave him back his change, he slid the silver into his right front pocket and the paper money back into the wallet, and reach beneath his jacket to return the wallet to his back pocket. Then he'd extend his hand for the bottle. He did not want a bag. I would watch him turn to his left and catch my eye. A lively twinkle rose. Each time: I threw my glance far across the store to the place where Arthur Perry still stood, watching. He would give me a brief, sure nod: each time. Then Art turned back to his duties, to the measuring, and counting, the pouring, the greeting, the hand-shaking; while the old man made his slow way to me. He'd ask how I was: each time. And I would tell him fine: each time. Then I, in turn, would inquire after his health, and he would allow as how he'd been getting by well enough, he reckoned: each time. Then he would raise his hand just as I lifted my own, and into my hand he would gently place the bottle. And I would open it for him, taking off the cap. I'd shake one pill from the bottle and tender it to him to place in his mouth. I'd hand over a cup of water that I would have already poured for him. While he drank, I would replace the cap, turning only half-way, so that when he went home, alone; when he rose in the night with an attack of the pain which the pills relieved, he could open the bottle himself. When the old man had drunk his fill -- enough to swallow without difficulty -- his dry hand reached for the bottle and I gently placed it in his palm. He'd curl his fingers around the small brown bottle and I would watch, time after time, as he slid it straight up into the right-hand pocket of his worn suit coat. It would not spill. Then he'd take one of my small white hands in his two black, arthritic hands and he'd say, each time, each time: Thank you, my dear. Thank you. Then the old man would softly slide his hands off of mine and step back, almost as though he'd gotten one minute too close to me. Invariably I raised my eyes to look into his but could not help seeing Arthur Perry observing me from across the store. We nodded as one. I would pull from my belly a weak acknowledgment and then the old man would gaze at me for a few more minutes, letting his cloudy brown eyes absorb whatever timid emotion crept across my face. As Arthur watched the back of the old man's head from the pharmacy, the old man would turn, raise one hand in a brief salute, and slowly walk to the door through which he had come; through which he would go; and through which we always believed he would return. I left St. Louis in June of 1980. Sometime between then and the mid-1990s, that drug store succumbed to the unrelenting march of progress. The building is gone. The restaurants in which I ate dinner and scribbled poetry have been closed, and re-opened as other restaurants with more modern themes. Arthur Perry went to work for Eli Lily doing pharmaceutical research. I saw him once in the decade during which my mother died, when I had come home for her funeral and my brother Stephen and I went to the Central West End for dinner. Art sat at a table of elegant people, none of whom I knew. We briefly spoke and I saw that while his eyes still pierced, he did not recall the poignancy of the days when we worked at the same place, a place where an old man came in order to be treated with dignity, at the end of a life that none of us understood nor even attempted to know. Symphony music plays in my ears now; a piece on the radio about a composer from the 1930s. The bars flow and the violins keen and outside of my house, the sun shines with an intensity that I feel sure it cannot maintain. Winter draws near. The drums roll and I think, whatever became of that old man? And I wonder, for the thousandth time this week, what will become of me. Most of you who are reading these Musings know that my father-in-law, Jabez Jackson MacLaughlin, died yesterday, 05 November 2014. I would like to share the story of my relationship with Jay by way of my own private but publicized eulogy for him. I plan to attend his service but Jay had an aversion to funeral proceedings which included family members popping up and down to moan over the departed. He found it tacky. However, he liked my blog, and often read it, so I think I am safe in telling this story, here, today, in my way. I first met Jay in the summer of 2009 when his son, James, and I started dating. Jay shocked me with his irascible nature and the somewhat dated views which he held and freely expressed. But he made a killer flan and always served a special, non-red-meat entree for me when Jim and I came to his house for dinner. In the early years of my relationship with Jim, I struggled to get my footing with his father. I once had a complete and total meltdown in his kitchen when he scolded me for stirring caramel and causing it to crystallize. His daughter, Virginia, placed her hand on my arm and counseled me to "shake it off". But shaking off the scoldings of the men in the generation above me does not come easily to me. It's no secret that my father, rest his soul, ruled our house with a leather belt, an abusive manner, and a volume level that would scare the paint off an old stairwell. Though I got the least of his wrath, being sickly and something of his favorite, still, I suffered enough of it and heard it all. I came to middle-age with a tendency to shiver and retreat when faced with an angry man. Over the next three years, Jay and I fenced our way to an ability to tolerate, if not like each other. And then, as fate sometimes dictates, something arose to bind us inexorably to one another. His beloved wife Joanna became ill, and Jay and I, along with his children, became her care-givers. In the seven months between the onset of her last illness and her death, Jay and I became fast friends. I grew to love him, to listen to him, and to respect him. Over that year, I found a new way of understanding Jay. He never raised his voice to me though we did not always agree with one another. He treated me in that "old-fashioned" way that men of his era treat women, and as time passed, I no longer saw his proclivity to pay my way and hold doors for me as a sign that he thought me less significant due to my gender. In fact, it meant quite the opposite, and I learned that from him. Jay received his diagnosis of cancer in June of this year. I found this development unsurprising. Joanna died on 08 October 2013 and he longed for her presence with an intensity that rendered me breathless. I felt he wanted to go to her, as she was clearly unable to return to him at least in any largely satisfying sense. And so, when he took me to lunch and talked about his cancer, and his inclination not to undergo chemotherapy, I reached the conclusion that he had no objection to death even if he hoped not to suffer in the dying. Still, speaking strictly for myself, I did not want to lose my favorite curmudgeon. I loved him. I looked to him as a father and felt honored that Jim and Virginia willingly tolerated my doing so. We had lunch and dinner outings, explored the Internet, and had our own personal happy hours. He called me several times a day in the year after his wife died. He would call to check on me, to talk about a future dinner date, to share some idea that he did not want to forget, or just to hear my voice. By the end of his life, he had taken to calling me sometimes six or more times each day and I would stop nearly any pursuit (as long as there was not a judge involved) to take his calls. As the fall progressed, I found myself increasingly fearful that he would let himself slip away long before the year that he had been given. I found myself bargaining with him to prolong his life. The biggest pay-off would be the running of the 90-day exclusion period for his Long Term Disability policy. Jay liked nothing so much as the thought of sticking it to that company and the mere mention of that potential caused him to salivate. "Oh yes," he would say. "Got to get my money's worth for that policy." I'd cast my nervous eye on him and wonder if he meant what he said. He held his body in a still, silent way which suggested otherwise. But I chose to believe him. I had no recourse: To concede his impeding demise would cause me to lose my composure, and Jay hated to see me cry. By September, no one believed Jay should continue to live at home alone, so off to a respite center for evaluation he went. On one of his five nights there, I brought a fancy Happy Hour kit, assembled by a clerk at the Plaza's Better Cheddar. Jay loved Happy Hour. "It's five o'clock," he would say; and any whose attendance had been summoned had better be present or the drinks would be poured in their absence and weak upon arrival. I brought smoked salmon, and slices of expensive hard salami; fat ripe blackberries; good crackers; and a bottle of wine. His cousin Anne Jones arrived with her service dog, Katie, and a box of chocolates. We laid out the spread on the hospital bedside table and Jay ate the entire package of salmon and most of the salami. He drank the whole bottle of wine himself, save the half-inch that he allocated to me, allowing me to pretend that I drink without actually having to do so. Anne Jones called Katie to hop on the bed and Jay placed one spotted, worn hand on her head and smiled, with absolute tenderness. 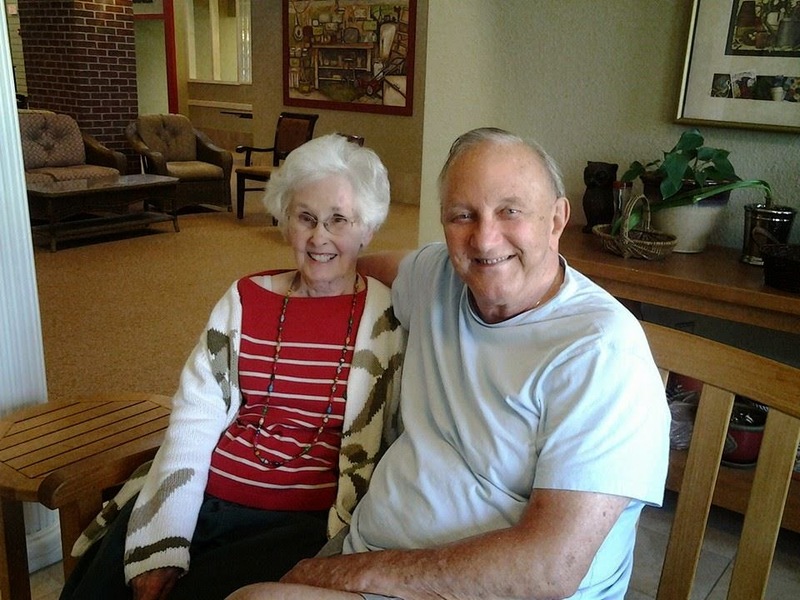 Jay moved into assisted living at Brighton Gardens at the end of that week. We talked. He told me that he wanted to die at home and hoped that he could do so. He planned to use the sojourn in BG to "get strong" and move back to the house that he and Joanna had shared for nearly two decades. I indulged that dream. As far as I was concerned, I would fetch him back to his house in my car and stay 24/7 if that would give him an easy death. But his decline continued. I'd tell him, "You can't die yet, Jay; we've got 60 more days til we can stick it to the insurance company," and he'd reply, "Don't worry about that! I'm getting their money!" In mid-October, I asked Jay if anyone had arranged for him to vote. Now, the mere inquiry should cause your eyebrows to shoot skyward. I am by way of being a yellow-dog Democrat, Missouri-born and bred, daughter of a union organizer. I've actually been accused of being a Socialist, and but for the sheer unworkability of the philosophy, I find it appealing. Jabez J. MacLaughlin, on the other hand, was a life-long Republican who crossed party lines once to his deep regret and would never do so again. He broadcast that fact publicly and firmly, even vehemently, though never disrespectfully at least not in conversation with me. But Jay was my father-in-law and I loved him dearly. I knew that he had taken a strong dislike to the candidate running against Senator Pat Roberts in Kansas; and that he scorned the process by which he believed the race came to be narrowed to two, with the withdrawal of the weak Democrat candidate for pretensive reasons and the resultant strengthening of the chances of the Independent. So I told him that I would handle his application for an absentee ballot, but on one condition: That he promised not to die before the election. You see, I saw the look of death begin to gather round his eyes a month before he passed, and I longed to stave off the certain surrender as long as possible, because I am both greedy and shameless. I did not want to lose him. I don't think Jay's zest for life prompted his to promise to live until November 4th. He yearned to be with Joanna, whom he knew waited for him. I often visited her resting place and told him of my visits, showing him pictures of the flowers which I brought. "Tell her that I will see her soon," he'd instruct me. And I did. Every time. No, Jay strove to endure because he wanted to vote against Senator Roberts' opponent by voting for Roberts. I filed his application and the election board mailed the ballot. But it didn't come. On October 23rd, at my request, they mailed a second one. It still didn't come. On the morning of Monday, November 3rd, Jay called me. We had discussed his voting in each of my visits the prior week, and I assured him that he would vote if I had to put him on a stretcher and push him to his polling place. But he grew weaker and I feared that voting in person would be hopeless. Had we thought, we could have changed his address to the facility, but that might have hastened his demise by destroying the charade which he liked to maintain that he would return home one day to die in his own bed. So the absentee ballot looked like the only option, with the potential for its receipt dwindling. In that Monday morning call, Jay said, in a craggy voice which showed the gathering weakness, "I don't suppose there's much chance of my voting now, is there, honey? I'm getting weaker." My heart clenched and my stomach turned but I kept that out of my voice and said: "I will get you a ballot if I have to walk to Olathe myself and bully someone into giving it to me. So hold on, Jabez J. MacLaughlin. You promised me." And my favorite curmudgeon replied: "I'll try, honey; but hurry." I placed a call to Olathe and talked to my contact there. She passed me to a supervisor who passed me to someone else. I explained what had happened and Jay's situation and she said that I should come ahead and she would get things started. I got on the highway, weak eyes and all, and drove like the wind, following the directions which the lady had given me. I arrived at the Election Board and discovered a line of early voters which extended the length of the building. I told one of them why I was there and the line parted. Like Moses, I crossed the Red Sea. At the counter, I told the woman that I needed to speak with Cheryl. She instantly replied, "Are you the lady with the dying father-in-law?" and I burst into tears held back since Westport. I did not need to answer. Twenty minutes later, I had been certified as Jay's Election Assistant and slid back behind the wheel of my car, sparing only a few moments to fear getting stopped for my long-expired plates. I leaned my head on the steering wheel and remembered my mother's death in 1985 when, with expired plates, I drove from my cousin Theresa's house to my parents' house at 7:00 a.m. to see my mother's dead body, passing a police officer going 50 in a 35 with four months' gone tags. He stopped me but gave me a warning when I told him the nature of my errand. I prayed for such leniency on I-435 and took off. At my father-in-law's bedside, I completed the forms for his voting process: my pledge, his designation of me, a copy of his driver's license. Then we started the ballot completion, with Jay too weak to fill in the black circles and me, the Democrat from St. Louis, doing it for him. With my help, he voted for Mr. Roberts and a score of other Republicans, and cast a vote against a couple of taxes and a judge with liberal tendencies which he described in a spat-out sentence which I will not here repeat. I take some credit for reminding him of that judge being on the ballot, for he had already said, in a fading voice, that he did not know or care about any of the judges. Jay took the pen in his hand to sign his name to the ballot, and I steadied both page and pen. And when he had done, he laid back against his pillows and told me: "When Senator Roberts wins by one vote, I want you to call him and tell him that it was my vote, and that I voted for him in spite of himself." And then he closed his eyes, his meager allotment of energy for the day spent. I took the ballot to Olathe and return to his room. I spent several more hours with him, just he and I. And the next day, Election Day, I abandoned my Democratic Party Certified Poll Challenger duties after only two hours to go and sit by his side until his son could arrive. He held my hand. He told me that he knew I loved him. I laid my head on his arm and wept; and he told me not to cry. He hated it when I cried. By 1:30 on Tuesday, November 4th, 2014, Jay had slipped into a kind of sleep from which he would not emerge. His son and I sat by his bedside for that day and through the night. I kept my hand on his heart while he slept. And once again, the irony rose thick and full: I watched the election returns with Jim on Fox News, and injected my voice with enthusiasm as I kept my favorite curmudgeon apprised of the results. And when the tables turned, and the senate went red, I took his hand in mine and told him, "You did it, Jay; Senator Roberts won; and your party has taken the Senate." And he smiled at me. I swear on my mother's grave: The news of the election results drew a smile from my favorite curmudgeon, as he lay in a sleep that would carry him to his Joanna's arms. Forty-eight hours nearly to the moment from when he performed his last act, signing his name to that ballot, Jabez Jackson MacLaughlin slipped from us. His wife's love filled the room. One of his children held each hand. His death came easy. The deaths of good people should always be easy. This morning, I crafted a letter to Pat Roberts. I told him a sanitized version of Jay's voting for him -- I pulled no punches about how Jay felt about him but left out the bits about my tears. I gave him Jay's message, and one of my own. I charged him with the responsibility of making Jay's endurance worthwhile. I asked him to do his duty, in honor to those who entrusted it to him,including and most especially my favorite curmudgeon..
Jay gave me something that I thought I would never have. He gave me the relationship of a father to a daughter. He loved me. He cherished me. He taught me, by example and by word; by action and by the smallest most meaningful gestures: The slight wave of his hand; the tilt of his eyes; the set of his jaw. That his son married me and gave me the most precious gift of being Jay's daughter-in-law endears him to me far beyond any love that I feel for my husband, far beyond any strain that our marriage has had, far beyond the cracks which might never be repaired. On the night that Jay died, I said that my words about Jay were mixed with the salt of a thousand unshed tears. And so they are: and so they shall stay, when the tears have fallen and dried; when the handkerchiefs have been re-washed; when the calendar's pages have fallen and withered. When I go to visit them in their resting place --- Jabez and his Joanna -- I will place the roses on their headstones, and I will touch, briefly, their names engraved in the stone. And I will know, as surely as I know the enduring nature of their love, that I will never feel anything but gratitude for my curmudgeon and his beautiful bride. At the same time, though, I will never overcome the hole in my life where Jay once was, beside the hole that was once Joanna. A gossamer sheen might sweep itself over the rending. I can hope for little else. But I will hold my head at the tilt which he taught me: Chin up; eyes bright; and smiling. For my tears hurt him; and he has suffered enough. His was a noble life though in many senses, a humble one. He raised two children and provided for them in a confident manner. He spent the last twenty years of his life traveling, and cooking, and caring for his Joanna. And me. He cared for me. Any goodness that still blooms in me, abides in part because of his tender nurturing of my spirit. And so, I bid farewell to my favorite curmudgeon. I will miss you. We never got to Lourdes, as we planned; but by God, we voted. We voted. And that's something of which we can both be proud. (1) For those who do not catch this reference -- Douglas Adams wrote "The Hitchhiker's Guide to the Galaxy", the "increasingly misnamed trilogy" which had five books. A light frost kisses the mound of leaves in the yard outside my window. I sit on the couch, the green couch that I never thought about wanting. 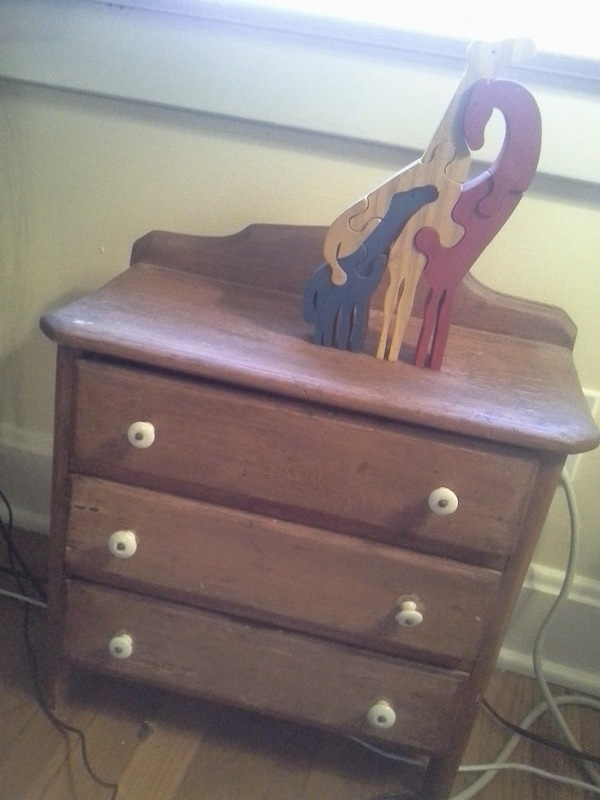 It's flanked by my rocking chair, and at its right arm, there's a child's chest. It's a toy dresser that a grandfather from a family not my own made for a daughter not my own. On it sits a giraffe puzzle from the Renaissance Festival which I purchased for my son over twenty years ago. I feel as though I'm in a cubby, coffee at hand, newspaper abandoned on the oak coffee table, and the half-raised blind letting in the feeble sunlight struggling to overcome the barrier formed by the remaining leaves on the neighbor's trees. A squirrel scampers down the trunk of the maple on the west side of the street and runs under the a parked Dodge. Two birds light on the sidewalk, wings fluttering. I have ear-buds playing the local public radio station snug in my ears and Scott Simon is interviewing someone who has been attempting to determine that he is related to everyone on the planet. I'm feeling a yearning to hear a twang from what my nieces call the Lou; I don't feel related to anyone here, don't feel the warm course of anyone's blood racing through my veins. I feel alone. And in my moments of feeling most alone, some tender memories flow around me. The same year that we bought the wooden puzzle, I took my son trick-or-treating with the family of the woman who provided his daycare that year. I had just moved into the Holmes house, unwittingly purchasing a home that had belonged to another family from God's Children Daycare, the place where Patrick received care while I tried to start my law practice. 1993; Patrick had turned two in July. All of our boxes had been unpacked and our mourning doves, Larry and Lady Bird, had nested in their cage on the front screen porch. I dressed Patrick in his Batman pajamas which he insisted could serve as a costume. He slid his little feet into his black cowboy boots and clutched the handle of the plastic pumpkin in which he would collect candy. We drove to Diane's house, not too far south, and parked at her curb. She opened the door and gestured for Patrick and me to come into the house, where she had mugs of hot chocolate and thick slices of bread with peanut butter and jam. Her own children crowded around the table. Patrick hung back, with his stuffed Goodnight Moon bunny in one hand and the pumpkin's handle in the other. Though he played every day with these children, he seemed suddenly shy of them. I did not push him. Diane's husband came into the kitchen from a back room in their house and handed Diane and me flashlights. I shoved mine into my jacket pocket. I wore a light blue windbreaker that had been the only coat besides a friend's inherited mink that I had been able to wear during my pregnancy. The jacket now hung down to my knees and provided cavernous pockets, a wide collar to warm my neck, and, with its color, visibility. It seemed the perfect jacket for walking the streets of south Brookside in the chill of Halloween. Diane carried a large silver bowl to the front stoop and set it on the step. She filled it with candy bars and taped a sign to the front which said, TAKE ONE. As we walked away from the house, with a soft wind rustling the fallen leaves, I looked back at the bowl and thought, what are the odds that each ghost or goblin will only take one? Diane noticed my glance but did not speak. Diane had more faith in the honesty of trick-or-treaters than I. But then, Diane did not live very close to the streets of the East Side with its teenagers who had started knocking at my door before I got Patrick ready; who kicked my screen when I told them I did not have candy to give because I had not planned to be home. We walked away and rang the bell of the first house just as a little ballerina and her hobo brother reached down to extract one candy bar each from Diane's silver bowl. The children lasted two or three blocks but got enough in their pumpkins to thrill their little souls. We strolled back to Diane's house in time to see a five-foot tall witch with a couple of midget Ninja Turtles take the last two candy bars and replace the bowl on the porch. Diane looked at me and raised her eyebrows as I buckled Patrick into his car seat for the trip home. I smiled. Her husband guided their children towards the house and bed while Diane hugged me and told me to try to have a good rest of my night. She stood on the sidewalk in front of their house watching me drive away. I could not understand the set of her shoulders and would not, until I heard, a month or so later, that she and her husband had separated. But on that night, that Halloween night, Diane and her husband, their two children, my son, and I, formed a movable tableau of Americana. Patrick fell asleep with his bunny tucked in the crook of one arm and a black spider from the dollar store clutched in his hand. I adjusted his cover. I retrieved a few toys from his floor: the giraffe puzzle we had gotten a few weeks before at the RenFest; the cloth ball with a rattle inside leftover from his baby days; the stuffed polar bear that our first neighbors in this house had given him along with a copy of Polar Bear, Polar Bear, What Do You Hear. I lit his nightlight and left the room. I pulled down the shades, turned out the living room lights and went to bed, in the quiet of the Holmes house, the house in which I presently write, a house too quiet by more than just half.